Additional Info: The plant is indigenous to India, Southern Canada, the US and other countries. The stem is straight and covered with multiple branches, may reach 1-2 feet in height. Its surface can be smooth or haired. The leaves are green-colored and ovate. The plant blossoms fro mid-summer to late autumn with white or purplish flowers. The fruit contains many seeds. Elements Applied: Leaves and fruit are applied in herbal medicine. Used For: The leaves are particularly applied for coughs, nervous tension and disorders. They also help induce urination and perspiration, as well as boost metabolic rates. The fruit is also applied to increase metabolism, stimulate the body and induce urination. 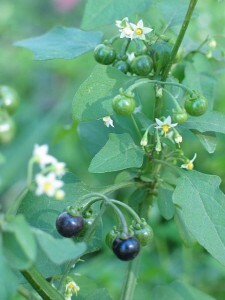 The list of conditions in which Black Nightshade is applied includes: swollen testes, spleen enlargement, skin conditions, liver enlargement, inflammatory swellings, hemorrhoids, heart disorders, gonorrhea, coughs, fevers, and edema. Used orally in inconsiderable quantities, leaves induce excessive sweating, and relieve constipation. Fresh juice is applied to relieve pains and reduce fever. Applied in considerable amounts, black nightshade can result in strong poisoning, which won’t, however, lead to lethal outcome. As a topical remedy the herb, usually its leaves, is applied for tumors and skin conditions. Fresh berries are poisonous; however, when cooked properly, the toxic agent in them is eliminated, thus the berries are applied in pies and jams. Additionally, the plant is used for gout, rheumatism, and skin inflammations. Herb juice is prescribed in case of recurrent liver enlargement. Eye and ear conditions can also be treated using the remedy. Occasionally, the plant is used to rejuvenate the system. Preparation and Intake: The herb is applied in form of decoction, syrup, poultice, extract, and powder. Safety: Warning! Berries are occasionally poisonous. Taken in large quantities, the herb may lead to strong poisoning, but, fortunately, not lethal one. The herb should not be applied orally without medical control.